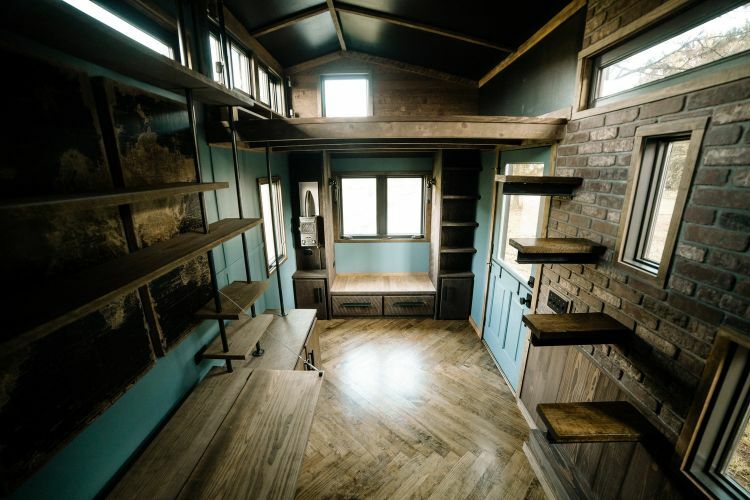 Wind River Tiny Homes is restoring the notion of the American dream by offering custom tiny homes that are both sustainable and high-quality. That quality level comes to life in The Rook, a modern/industrial custom home boasting a moody vibe. 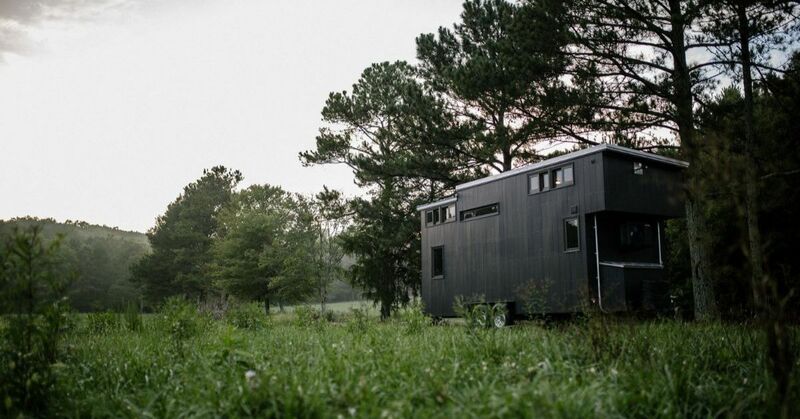 At just 22 feet long, The Rook offers every convenience of a larger home along with the benefit of off-the-grid options such as a full solar system and compostable toilet. The model pictured is just $99,500 and is complete with premium lighting and appliances, as well as custom hardware. 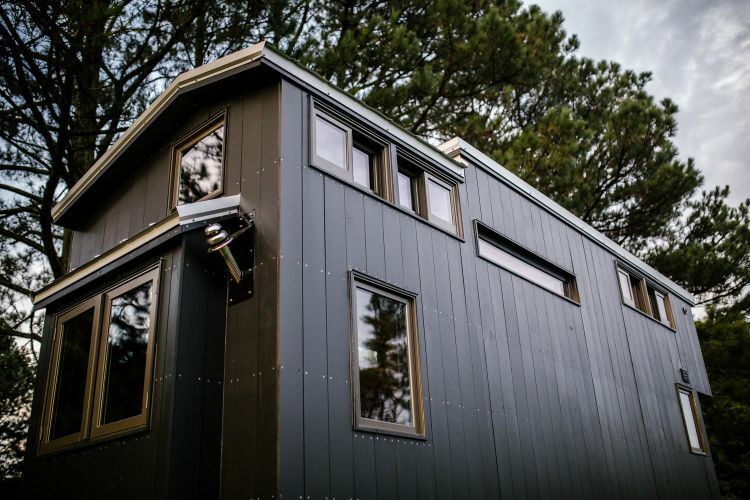 Painted vertical siding with exposed screws and a custom roofline creates a custom-built look on the exterior. A Dutch door leads to the meticulous interiors, which feature herringbone wood flooring and custom built-in bookshelves and cabinetry. The kitchen features an integral concrete countertop and sink for a seamless look, paired with a modern pull-down faucet. 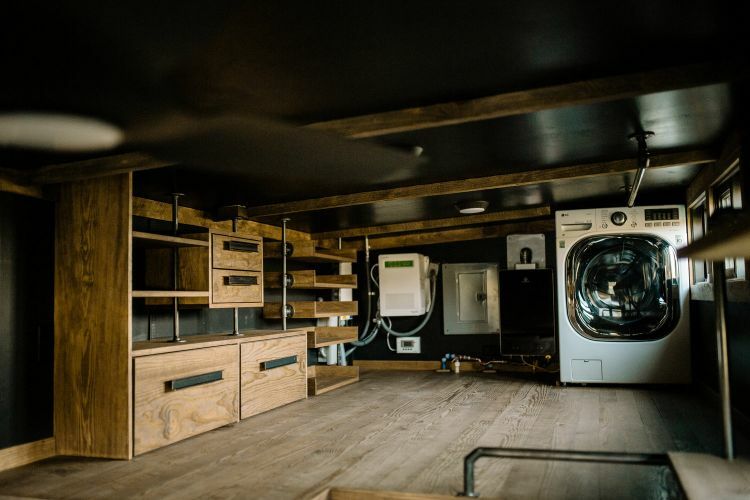 Custom black pipe and wood open shelving stashes all of the necessities, along with a wooden spice rack cube. 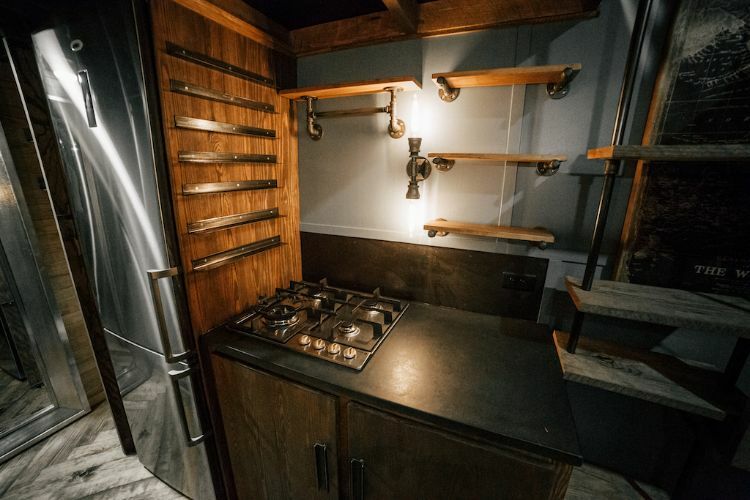 More shelving and storage is situated next to the range, which features a stovetop with several burners. The kitchen also includes a full-size stainless steel refrigerator and freezer. 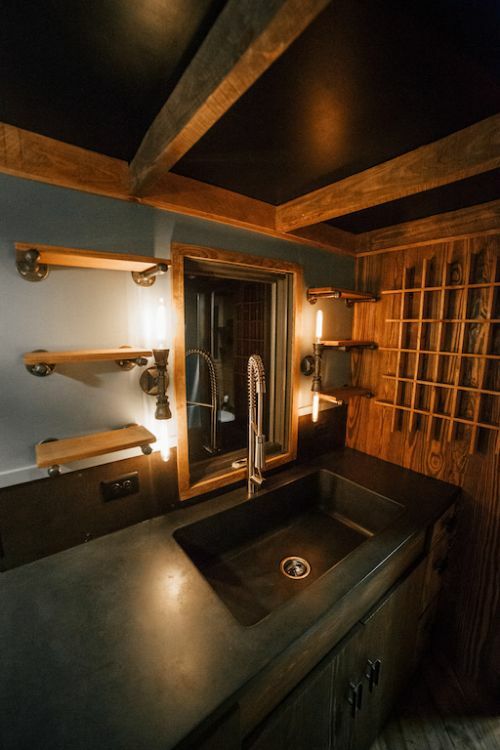 Raw steel drawer pulls and handles complete the industrial look. For an efficient workspace, the Tennessee-based company created a custom welded bookcase and fold-down desk. At the back of the home, a built-in window seat and shelving offers a cozy space to crack open a book as the sun streams in. Floating rebar steps lead up to the loft, which offers a roomy sleeping space big enough for a queen bed. A brick wall complements the home's modern, industrial look. 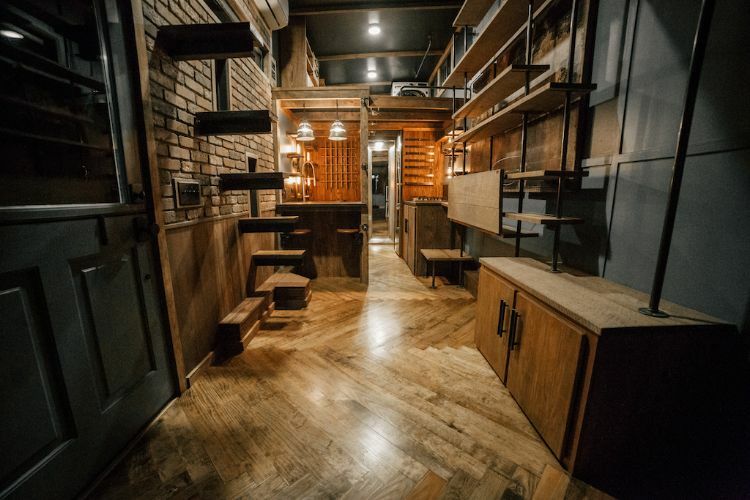 Upstairs, the master loft boasts built-in cubbies and a ceiling fan. 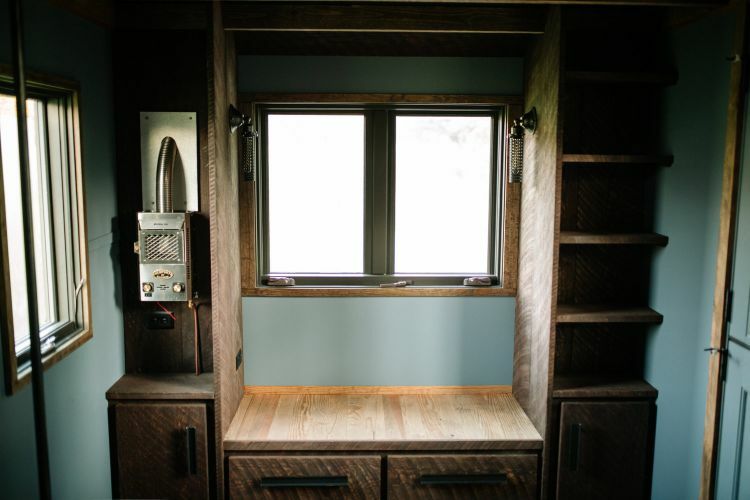 The bathroom includes a Nature's Head Composting Toilet for complete off-the-grid living. 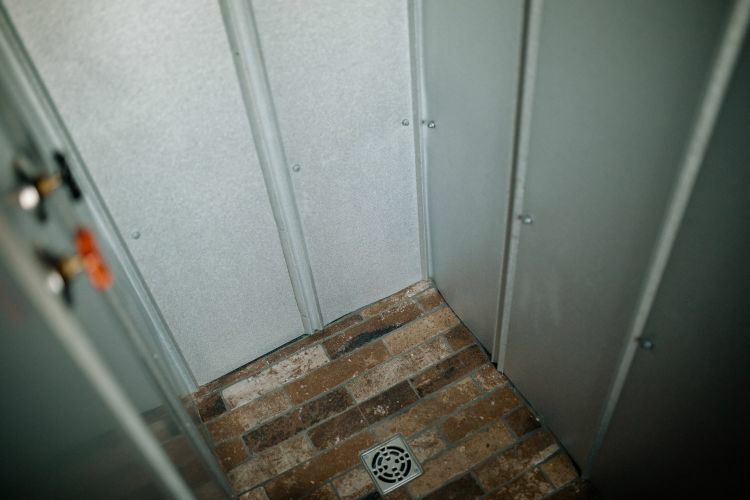 The shower features brick tile underfoot and is surrounded by Galvalume metal walls. A secondary loft offers additional storage as well as a tankless water heater, breaker box and washer/dryer combination. 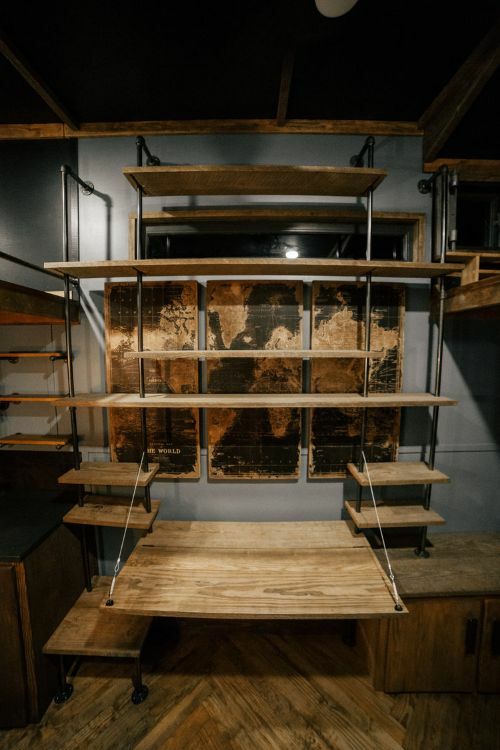 Ample shelves and built-in closet space provides plenty of storage options.